The delegation attended all meetings of the Council and conveyed its views on discussions under different agenda items. Specific statements were made during interactive dialogues with the Special Rapporteurs on contemporary forms of slavery, Older persons, Water and Sanitation, Right to Development and Unilateral Coercive Measures. Statements made by the IPHRC delegation were circulated to all Member States and are also available on the OHCHR website. The IPHRC delegation also took the opportunity to attend and participate in a number of relevant informal events on various issues of human rights concern to the Commission, on the sidelines of the ongoing Council Session. Both the discussions in the Council and the side events provided a useful opportunity to better acquaint with the ongoing discussions on issues of concern to the IPHRC as well as enabled them to share their views on these subjects with the global human rights community. A number of civil society representatives from Myanmar, Indian Occupied Kashmir and different international human rights organizations also met the IPHRC delegation and shared views on issues of mutual interest/concern. The Executive Director also had some follow up meetings with the relevant UN OHCHR officials including the Director of the Council Branch in OHCHR, and discussed / coordinated upcoming joint activities including the IPHRC International Seminar on Islamophobia and the 14th Regular Session in in October and December 2018 respectively. As always, the delegation took the opportunity to participate and convey its views on discussions under different agenda items. Specific statements were made during interactive dialogues with the Special Rapporteur on Myanmar and Panel discussion on Internally Displaced Persons (IDPs). 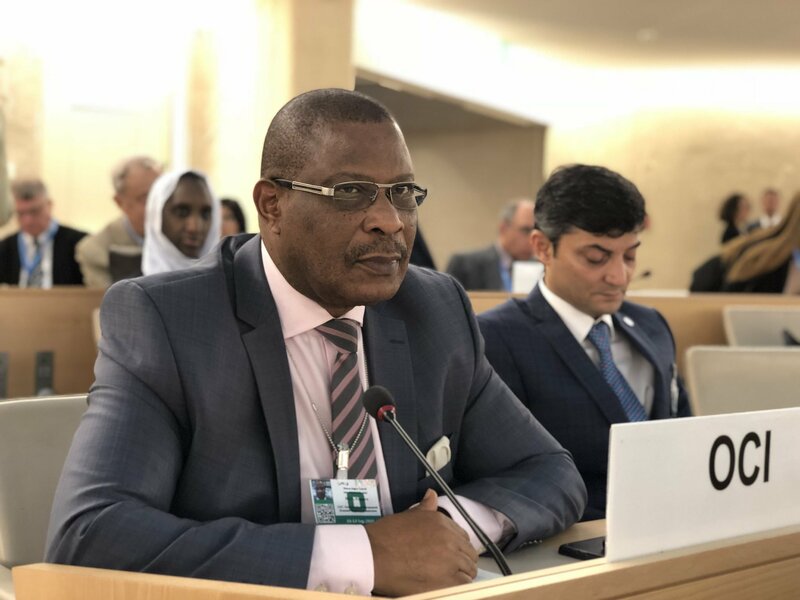 Statements made by the IPHRC delegation were circulated to all Member States and are also available on the OHCHR website. Further the IPHRC delegation attended informal events on various issues of human rights concern to the Commission, being organized by different stakeholders, at the sidelines of the ongoing HRC Session. These events provide an opportunity to reach out to the global human rights community and share mutual experiences on subjects of mutual interest. A number of civil society representatives from Myanmar, Sri Lanka, Indian Occupied Kashmir and different international human rights organizations also met the IPHRC delegation and shared views on issues of mutual interest/concern. IPHRC delegation also utilized the opportunity to interact with relevant UN officials to discuss and coordinate their ongoing cooperation and plans for joint activities during the year. Dr. Rashid Al Balushi, Chairperson of the Commission also briefed the OIC Ambassadorial Group in Geneva on the ongoing work and activities of the Commission. Jeddah 08th May 2018: OIC Independent Permanent Human Rights Commission (IPHRC) delegation led by its Chairperson, Dr. Rashid Al Balushi, participated in the 45th Session of the OIC Council of Foreign Ministers (CFM) held in Dhaka, Peoples’ Republic of Bangladesh from 5-6 May 2017. The meeting was attended by the Foreign Ministers and high-level representatives of OIC Member and Observer States as well as all heads of OIC organs and institutions.